Who jumps out of a perfectly good airplane from 18,000 feet in the air? The crew at Chicago Skydiving Center can’t resist the thrill of this adventurous, crazy sport – and they take pleasure in sharing the experience with other brave souls. Becky Johns thinks skydiving isn’t nearly as scary as it sounds. After more than 800 jumps, she finds it rewarding. Johns is a skydiving instructor and marketing director for the Chicagoland Skydiving Center (CSC), in Rochelle, an organization that has, since 1968, introduced more than 400,000 people to the sport of skydiving. Boasting a friendly staff, modern facilities and equipment, and multiple turbine aircrafts, CSC has everything needed to safely jump out of an airplane from nearly 18,000 feet in the sky. The facility has a perfect safety rating, meaning there have been no fatal accidents in its history. Skydiving is the main attraction at CSC, but there’s much more to enjoy here, such as a banquet space for weddings and other private events, a sand volleyball court, bonfire pits and The Flight Deck Bar & Grill, a bar and restaurant with an outdoor patio that offers drop-zone views. Jumps may occur from April through October, but The Flight Deck is open year-round and can host and cater events for up to 500 people. It includes an open-concept kitchen, outdoor beer garden and dining patio. It’s easy to feel as if you’re at a party. Music blares through the loudspeakers, even in the parking lot. Planes buzz overhead and parachutes fill the sky with color. You can smell the food coming off the grill at The Flight Deck. And, if you strain a little harder, you might smell the fear coming from the latest group of jumpers. Every few minutes, a voice shouts over the loudspeakers, “Jumpers away,” and that’s when you know some brave individuals are leaving an aircraft almost three miles overhead. Between the pre-jump training and preparation, the actual jump and descent, and a bite to eat afterward, most people end up spending about half of their day here, Johns says. In 2011, the company moved its digs from Hinckley, 15 miles southeast of DeKalb, to the Rochelle Municipal Airport, a location about 80 miles west of Chicago along Interstate 88 and Illinois Route 251. Skydiving has come a long way since Frenchman Andre-Jacque Garnerin jumped out of a hot air balloon in 1797. A common means of troop delivery in World War II, skydiving became a popular leisure activity and recognized sport after the war, as many former soldiers began participating on their own using military surplus gear and joining in competitions. Naturally, the increased attention to the sport has led to new developments in parachute technology. Today’s divers have automatic activation devices, digital altimeters and other high-tech features that have led to increased safety in the sport. And, new innovations in design have improved upon the old, round parachutes, which tended to fall straight down and offered limited control. Modern skydivers can control their direction and rate of descent, allowing them to glide much further across the ground and nail a more accurate landing. First-time skydivers make jumps called tandems, meaning they are using a system designed for two people, and they’ll remain connected to their instructor for the entire jump. It’s the safest way to introduce people to the sport. In order to skydive at CSC, you must be at least 18 years old and weigh no more than 240 pounds – the maximum weight at which this equipment functions properly. Everyone is weighed before jumping. Before they’re airbound, jumpers get a briefing on what to expect, sign waivers and go through a brief orientation. They’re then geared up with a jumpsuit, harness, altimeter and goggles. CSC jumpers are equipped with a main parachute and a reserve, all packed by trained professionals who inspect the gear before every jump. The instructor also inspects the gear. All CSC equipment is maintained by a master parachute rigger. Once training is complete, the tandem passenger and instructor board the plane together. It’s about a 15-minute plane ride before the team reaches altitude. Then, it’s time to experience the world in a whole new way. There comes a point where people usually transition from fear to excitement. Feeling afraid in those final moments is perfectly normal, says Johns. To help cut the tension, instructors may offer a little humor. Once you jump, you’ll experience between 30 and 90 seconds of free fall – depending on exit altitudes. At a standard altitude of 14,000 feet, jumpers will experience about 60 seconds of free fall, cruising at roughly 120 miles per hour, Johns says. It’s too loud to carry on a conversation in free fall, but you don’t need earplugs. “It kind of feels and sounds like you’re sticking your head out of a car window on a highway,” Johns says with a laugh. Once that parachute opens, it’s pretty peaceful. You’ll be able to speak in a normal voice with your instructor. From the moment you leave the plane to the moment you land the patachute on the ground is about 20 to 25 minutes. When you get home, if your friends or family don’t believe what you’ve accomplished, you can show them your certificate of completion, which every jumper receives after landing. To help guests relax afterward, all jumpers are treated to a complimentary beer at The Flight Deck. 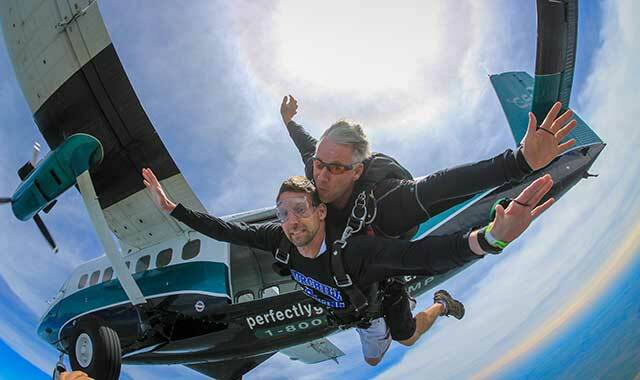 Those who truly enjoy the experience can return to partake in CSC’s Freefall University Skydiving School, a series of programs designed to take jumpers from their first tandem jump to a licensed skydiver capable of solo jumping anywhere in the world. The training program is a 25-jump comprehensive package, through which you can receive a United States Parachute Association “A” license. CSC is an official USPA Training Center and Group Member drop zone. The program also includes training tandems, ground school, Accelerated Freefall training, coaching, solo jumps, parachute packing lessons and optional indoor skydiving training. “Our solo jumpers are licensed from all over the world,” Johns says. The CSC is also home to the 2018 USPA National Skydiving Championships, a huge honor. Skydivers from all over the country will come to Rochelle to compete for the title of national champion in various skydiving disciplines. If you’re interested in jumping, but are nervous, Johns suggests bringing a friend or family member with you. They don’t have to jump, but having their support is important, she says. “Having someone you know who is on the ground, waiting for you, is huge,” she says. Johns says she has skydived hundreds of times, both on her own and with students. She doesn’t think it ever gets old. This entry was posted on Thursday, August 24th, 2017 at 11:57 am	and is filed under Features, Top Posts. You can follow any responses to this entry through the RSS 2.0 feed. Both comments and pings are currently closed.